Incredible range of more than 1,000 casino games for players to choose between. Low playthrough requirement for first deposit, reload deposit and no deposit bonuses. Some parts might be restricted because of your location. This Argo Casino review highlights the importance of reading the terms and conditions of online casinos before registering for an account. Fortunately, the terms and conditions of playing at Argo Casino are not overwhelming, and include some very useful information that will prepare you for an enjoyable online casino experience without having unrealistic expectations. An important area to read relates to what games are available to what players. The casino games at Argo Casino are provided by multiple software companies, and not all have a license to provide casino games globally. For example, if you live in the UK, Canada or Australia, you will be blocked from playing Live Dealer games. Other useful information can be found throughout our Argo Casino review, but we recommended you read the terms and conditions yourself to avoid any potential disappointment. This site is a great place to play casino games regardless of whether you like playing on a PC or mobile device. Argo Casino has both an Instant Play, browser-based version of the software and a casino client you can download for free. Mobile apps can be downloaded from the casino´s website and support just as many games as the full PC download. Excellent customer support is always available if you encounter any problems downloading or navigating the software. Argo Casino was launched in 2014 and is based in Gibraltar. The site is owned by Curacao-registered and licensed JocSystem, and primarily targets players in Europe. Consequently the supported languages consist of English, German, Chinese, Polish, Swedish, Russian and Romanian, while players can fund accounts in Euros, Bitcoins, Polish Zlotych, Swedish Kronor and Russian Rubles (no US dollars!). To deliver such an eye-watering range of casino games, the casino uses software provided by more than a dozen companies. Some of these will be well-known to casino players – for example BetSoft, Endorphina and MicroGaming – but some of the less familiar names are well worth checking out via the demo play facility before playing with any of your own funds. The first deposit bonus at Argo Casino is modest in comparison to most online casinos – a 120% match on the first deposit amount up to a maximum bonus of €200. 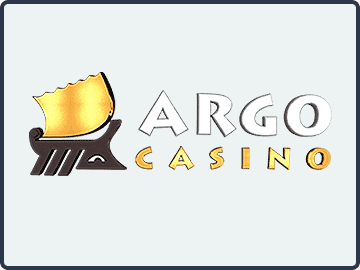 However, unlike online casino bonuses that have a playthrough requirement on the combined bonus and deposit amount, the Argo Casino first deposit bonus has a 40x playthrough requirement on just the amount of the bonus before a withdrawal can be requested. Before you get too excited at the prospect of an easy way to get your hands on some free casino money, the wagering contribution of non-slots games is incredibly limiting. Only video poker and casino poker games have any wagering contribution (10%), and games of Blackjack, Roulette and Baccarat do not count at all. Furthermore, you only have fourteen days in which to clear the bonus! Argo Casino runs loads of “free spin” promotions – you can even get free spins just by creating an account (although this promotion is not available to players in some countries). In most cases, the number of free spins you are awarded is proportional to how much you have deposited. They have to be claimed via Live Chat, who will also be able to tell you which slot games you can use them on. To prevent bonus abuse, the maximum amount you can withdraw from free spin winnings is €50. Before requesting a withdrawal, you have to have made a real money deposit into your account and the casino will conduct a security check to make sure you have not created multiple accounts to rip them off. Despite the limit on how much you can withdraw, the free spins offer gives you an opportunity to try out games you may not otherwise have considered and possibly find a new favorite slot. Fortunately, the site offers plenty of reload and no deposit bonuses. The reload bonuses consist of 30% bonuses on deposits made during the week (up to a maximum bonus of €500) and 40% bonuses on deposits made at the weekend (up to a maximum bonus of €1,000). Both these reload bonuses have the same clearing requirements and limited time span as the first deposit bonus. There are two ways you can get a no deposit bonus at Argo Casino. Either take advantage of the weekly cashback offer (15% cashback on net losses paid as a bonus) or convert your Loyalty Points (known as “Jasons” at the site) into a no deposit bonus. Please note: you have to activate all reload and no deposit bonuses by contacting Customer Support by live chat before your online action counts towards clearing them. The stand-out feature of this online casino is the unbeatable selection of casino games. There is in excess of 1,000 casino games to choose between, including more than 700 slots which are easy to navigate by type of game, software company, or by name. It is also possible to reach the type of game you want to play by typing it into the search facility (i.e. “5 reel” or “jackpot”). As mentioned above, every game can be played via a demo play facility. This is a great option for players who are unfamiliar with the payout lines or game features, and it avoids some of the unrealistic expectations that were also mentioned earlier. If you want to take advantage of this facility, we recommend playing in demo mode via the software download rather than web browsers (especially Firefox!). There are not a lot of terms and conditions relating to deposits and withdrawals, but they are still worth reading to ensure your transactions at the casino are processed smoothly. Most deposits are credited to your account instantly, and you have a choice of funding your account by debit and credit card, Bitcoin, various eWallets and Instant Banking facilities. Withdrawal requests are processed with forty-eight hours and paid to your funding source where available. If you have made a deposit using an option to which withdrawals are not possible (i.e. PaySafeCard, Mastercard, etc.) contact the Customer Services team and they will discuss alternative options with you. Remember to verify your account before requesting a withdrawal! The “Jasons” loyalty points program is like a VIP scheme you would find at any other online casino. As you play casino games at Argo Casino, you receive “Jasons” at the rate of 1 Jason per €50 wagered. A son as you have collected ten or more “Jasons”, you can exchange them for a no deposit bonus of around 9% at the lower levels of the program, rising to 13% as you achieve higher loyalty statuses. Like the first deposit and reload bonuses, the no deposit bonus has a playthrough requirement of 40x the bonus amount. However, rather than having fourteen days to clear the bonus, you have six months. Nonetheless, you need to be aware that the maximum amount of winnings from no deposit casino bonuses that can be withdrawn is limited to €50 – all other winnings will be forfeited. Remarkable range of casino games from some of the best software companies in the world. The opportunity to try out and become familiar with each game before playing it. Good multi-lingual Customer Support available around the clock. Lower than standard bonus percentages. Limited time allowed to clear bonuses. No cash tournaments – only loyalty point events. Overall, we feel Argo Casino is a great venue for players who enjoy plenty of variety in their online action. The choice of games – although not universally available – is particularly good, and you have the option of playing them wherever you go thanks to the site´s excellent mobile apps. Admittedly the bonuses are not world-beaters, but at least slots players will like the clearing requirements! Another area in which this site shines is its social media. The casino seems to have only recently discovered Twitter and Facebook, but is using both channels really well to provide comprehensive information about new releases and their features. If you decide to take advantage of some of the wonderful opportunities at Argo Casino, make sure you also follow the casino on Twitter.